How often are we told the volunteer military draws predominantly from the poor and uneducated, people for whom becoming cannon fodder is the only career choice available? Rep. Charles Rangel, D-NY, is often the source of such claims. But what do the facts actually tell us about where the typical American military volunteer comes from these days? Dr. Tim Kane, an economist who works in The Heritage Foundation's Center for Data Analysis, wondered the same thing recently, so he asked the Defense Department for all the demographic data he could get on recruits. What Kane got in response from DOD was an avalanche of demographic data about the 1999 and 2003 recruits. After conducting extensive statistical analyses on the data, Kane reached some conclusions that will surprise anybody who believes the conventional wisdom about who becomes cannon fodder. Check out the graphic above. 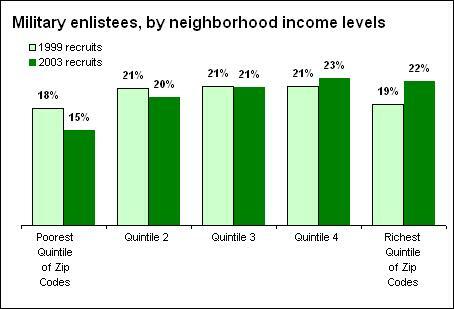 Note the proportions of recruits from each of the five demographic quintiles, organized according to per capita income by zip code. The percentage of recruits from the poorest quintile is actually lower in 1999 and 2003 than the percentage for the richest quintile. In fact, the percentage difference between the richest and poorest quintiles increases between 1999 and 2003! 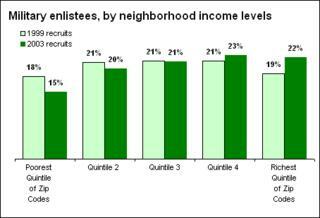 And the highest percentage is actually in the second richest quintile of recruits, followed by the richest quintile. It is no exaggeration to say America's most prosperous families bear the greatest share of the burden of fighting in America's defense. Kane has a complete report scheduled for publication later this month. Until then, copy this post to your local MSMers and ask them when they are going to report these facts about the brave men and women wearing the uniform of the U.S. military. By the way, Kane also is one of the instructors for the Database 101/201 Computer-Assisted Research and Reporting (CARR) Boot Camps co-hosted by the Media Bloggers Association and The Heritage Foundation's Center for Media and Public Policy at the National Press Club in Washington, D.C. and other sites around the nation. Go here for Tim's bio. Grim's Hall takes a look at the chart above and then compares it with data on geographical distribution of recruits, derived from the Pentagon's own analysis of the numbers for 2002. Conclusion? 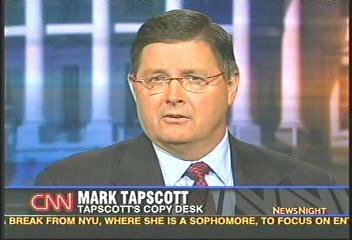 "The South is far and away the leader in recruitment, although it is the poorest region of the United States. The wealthiest region, the Northeast, trails in recruitment.That suggests that the media picture is even less accurate. "The military maintains these levels of representation in the richest and second-richest quintiles, while drawing 40% of the force from the poorest region in the country and only fifteen percent from the richest region. "That suggests that military recruitment is heavily disproportionate among the upper and upper-middle class everywhere but the Northeast, and probably certain parts of California." In other words, what the Left claims and what the facts prove are, again, almost exactly opposite. What is Going on in the Pentagon? Michael Yon Has the Story of "Operation Rmha"